So I've tried the whole watch thing three times, once in about fifth grade (a tiny blue watch from a surf shop), once in middle school (a big tan & pink Roxy watch), & once in high school (a silver 'boyfriend' watch from the bp. section at Nordstrom). The first two watches I never wore, but the third one I loved & wore a bunch until I dropped & broke it a few weeks after I got it (#winning). For Christmas my Aunt & Uncle got me a gift card to Nordstrom & then they gave me money for my birthday, so naturally they are both burning a whole in my pocket; lately I've been seriously admiring the watches I see everyone wearing & have the desire to use my presents to buy a watch! For the past few days I've been combing Nordstrom's website & came up with this list of watches that I love. 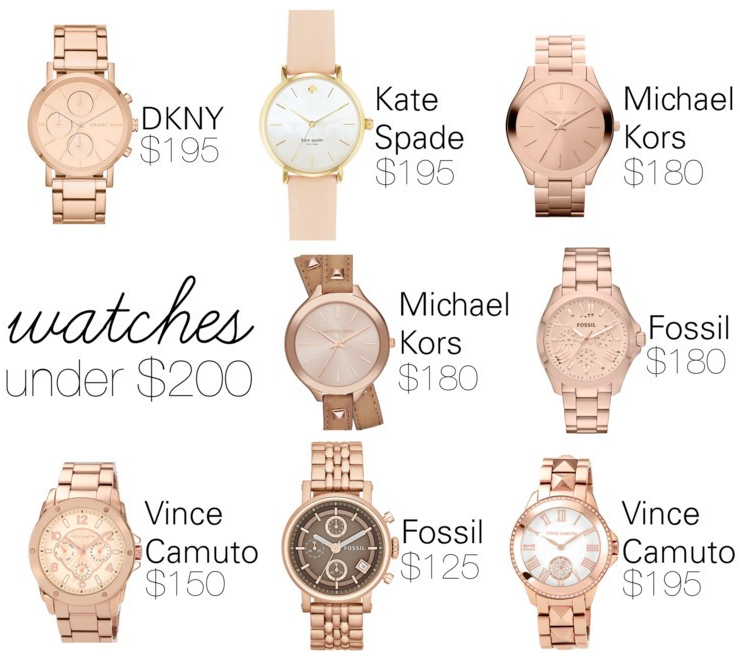 As you can see I've been looking for ones under $200, & have been really loving rose gold. While I really like all of these I've narrowed my favorites down to the Vince Camuto one on the bottom left, & the Michael Kors in the middle. However, I think that I will just have to go to the store to try them on & pick my favorite! What do you think of these picks? Which is your favorite? Also if you have any tips on picking a watch or a brand you like please share below! That Michael Kors one is different from anything I've seen out there recently--- I really love it! Watches are actually one of my favorite accessories... Thank you for sharing your picks! I just got a rose gold watch myself and I just need to size it. Great post. Hope you're having a great. I love the kate spade watch! Love the Michael Kor's watch in the top row. I want a rose gold watch so bad! I hear ya! I am in search of a large one with a square black face! i love the Vince Camuto one! I have a rose gold Michael Kors watch and it's one of my favorite accessories. You can never go wrong with a good watch! I loveeee my rose gold watch!! I have a Kenneth Cole with diamond-looking things around the face and it is so amazing!! The Kate Spade watch is my favorite! The leather strap is a really beautiful! I just finished writing a blog post about wanting a watch. then I scrolled through my blog feed and found your post! I like the Kate Spade one the best!